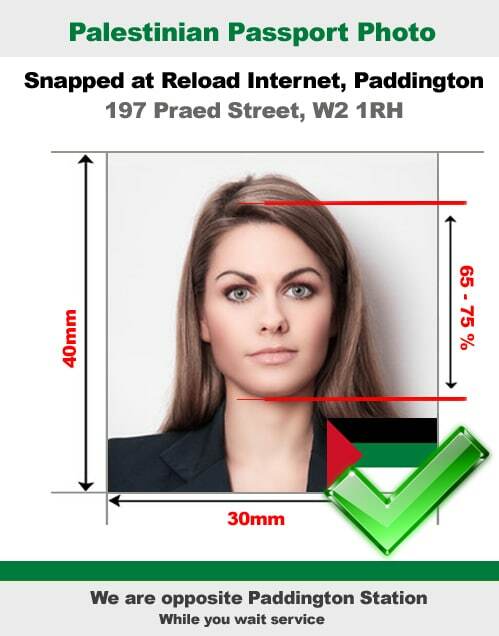 If your are applying for a Palestinian passport or visa, and are in need of a Palestinian passport photo or visa photo then come to Reload Internet in Paddington, London. 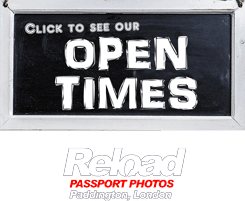 We are a professional passport photo studio that specialises in Palestinian passport and visa photographs, and take hundreds of passport and visa photos every single week. We have a team of trained staff that will be happy to assist you when you visit out store, you don’t even need an appointment just stop by and we can have your Palestinian passport photo or visa photo ready within 10 minutes. Our studio is located on Praed Street in Paddington, less than a 30 second walk from both Paddington train and tube stations. We are also open every day of the week, from early morning until late evening. We even close late at 8pm on a Sunday! So you are able to come and have your Palestinian passport photo or visa photo captured, printed and prepare at a time that suits you! Our team of highly-trained staff are here to help you with your Palestinian passport photo or visa photo. Using the most recent camera and printing tech, we can provide you with a set of extremely high-quality photographs that meet all of the necessary requirements stated by the Embassy of Palestine. Before we print off your photographs, we will ensure that they will pass along with your application when you submit it to the Embassy, saving you time, money and stress if something were to go wrong. If your Palestinian passport photo or visa photo fails to meet all of the specifications released by the Embassy of Palestine, then it is highly likely that your application will be rejected due to a photograph error when you submit it. When you come to Reload Internet, it removes any possibility of this happening to you! You will need to submit 4 identical and recent (no older than 6 months old) photographs that are sized 40mm x 30mm. You face needs to take up between 65 – 75% of the image (measuring around 26mm to 30mm from your chin to the top of your head). These images must have a plain white background and cannot have any shadows appear in the background. You will need to make sure that the image is an up-close shot that displays the top of your shoulders to the top of your head. You must be facing directly at the camera so that it can clearly show your entire face, including both sides of your face evenly. It also needs to capture your face from the bottom of your chin to the top of your face. You need to have a neutral expression on your face when the picture is taken where your mouth is closed, one without a smile or a frown. Your eyes must be open without any raised eyebrows or squinting. Even babies must have their eyes open for these shots. When the picture is taken, it needs to be taken at eye level with the person looking square into the lens. Images where the head is tilted or rotated will not be accepted. The flash on the camera needs to evenly distribute across the face so that no shadows appear in the image. You should take off your glasses if possible because the frames can obscure part of your eyes and cause a reflection that will cause the image to be rejected. You are not generally allowed to have headwear on when the photo is taken though there are exceptions to this especially for religious, medical and cultural reasons. If you wear these items on your head, they must not obscure any part of your face or cast a shadow that can negatively impact your photo. The photo cannot be manipulated digitally to improve facial imperfections. When the image is printed out, it needs to be printed out with a resolution of 600 dpi and on high-quality photo paper. There should not be any damage to the photo that you are submitting, such as creases. In general, the requirements for your passport photos also apply to your visa. You will only need to submit 2 identical images that measure 50mm x 50mm. You must ensure that your Palestinian passport photo or visa photo is in line with every single one of the requirements stated above, if they are not then your application may be rejected by the Embassy of Palestine. The specifications listed above are taken directly from the official Embassy of Palestine’s guidelines on passport and visa photographs, which you can find here.